1947 Passed his Matriculation examination, I.R. Belilios Institution. 1948 Admitted to Govt. School of Art and Craft, Calcutta, but could not continue due to financial difficulties. 1952 Bachelor of Commerce, Vidyasagar College, Calcutta University, Calcutta. 1956-58 Attended evening classes, Indian College of Art and Draughtmanship, Calcutta. 1959 Completed his Art Appreciation Course, Ashutosh Museum, Calcutta University, Calcutta. 1955 Joint exhb., Academy of Fine Arts, Calcutta. 1961 First solo exhb. of painting, Academy of Fine Arts, Calcutta. 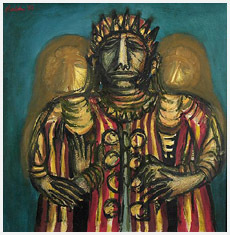 1963 Solo exhb., Arts and Paints Gallery, Calcutta. 1963, 64, 65 National Exhb. of Art, Lalit Kala Akademi, New Delhi. 1964, 69 Group exhb., AIFACS, New Delhi. 1965 Solo exhb., Artistry House, Calcutta. 1966 Solo exhb., Priyodarshini Gallery, Calcutta. 1968, 72 Group exhb., Kala Bhavan, Santiniketan. 1969, 71, 85 Exhb., Calcutta Information Center, Calcutta. 1970 Exhb., Birla Academy of Art and Culture, Calcutta. 1971, 73 Solo exhb., Gallery Chemould, Calcutta. 1971, 73, 81, 82, 85 Group exhb., Lalit Kala Akademi, New Delhi. 1972, 75, 78, 83 Group exhb., Birla Academy of Art and Culture, Calcutta. 1972, 74, 76, 78, 79, 80, 83 Group exhb., Jehangir Art Gallery, Bombay. 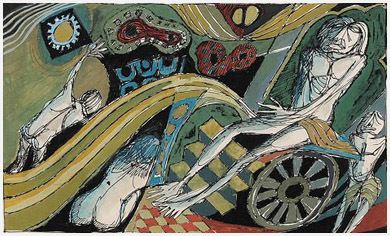 1974, 77 Solo exhb., Triveni Kala Sangam, New Delhi. 1975 3rd Triennale, Lalit Kala Akademi, New Delhi. Chicago Don Town Gallery, USA. Ministry of Industries, Govt. of India, New Delhi. Tata Engineering and Locomotive Works, Jamshedpur. Birla Academy of Arts and Culture, Kolkata. Madhavan Nair Foundation, South India. The Times of India, Mumbai. Charukala Parsad, Deptt. of Information and Cultural Affairs, Govt of West Bengal. Taj Palace Hotel, New Delhi. 2002 Received Abanindra Puraskar, Kolkata. 2004 `Rabin`, documentary film on him was directed by Mr. Buddhadeb Dasgupta. 2005 Book `After the Fall: Life, Time & Art of Rabin Mondal`, was written on him by the scholar Mr. Santo Datta. Rabin Mondal`s Cubo-Futuristic angularities of form and his arrangement of pictorial space in relation to them helped him evolve a series of highly individuated human figures. His repertory of humans is essentially experimental in origin. They came out of his growing abhorrence towards man`s moral decay in all spheres of life. He has imaginatively used the thick pigment for the gem-like incandescence of the stained-glass effect we see in George Rouault. 1953-54 Appointed as teacher in local high school. 1987 Joined as Lecturer in Visual Art Deptt., Rabindra Bharati University, Calcutta.